SmartAVI Multicustom-Pro solutions offer custom-built automation switching for all of your environmental control needs. From AC to TVs, these 7-slot modular controllers connect to infrared, relay, RS-232, and VCA devices, letting you control them over the Internet. 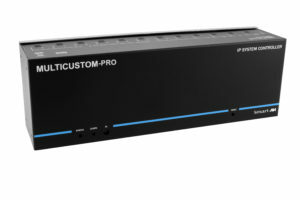 7-Slot network-enabled automation hub with custom-built connector configurations for residential and commercial use.